Next to a time machine, the next great wish of genealogy researchers is the ability to just type in a name and find their family information. Jones Memorial Library can help with one of those wishes and, no, it’s not a time machine. The Library maintains a Virginia families database that contains information about area families. 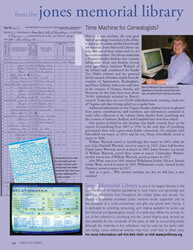 Several years ago, Nancy Jamerson Weiland, of the Library staff, contributed the Family Tree Maker software and her personal family research of families mainly from the counties of Appomattox, Buckingham, and Prince Edward, with some early lines in the counties of Henrico, Amelia, and Nottoway. At that time there were about 30,000 individuals included in Nancy’s research. Today there are over 93,000 individuals listed, covering a wide area of Virginia, and data is being added on a regular basis. Additional information in this Virginia families database has been gleaned from patron contributions, staff members, and information contained in many other collections at the Library. Many families from Lynchburg and the counties of Amherst, Bedford, and Campbell have now been added.